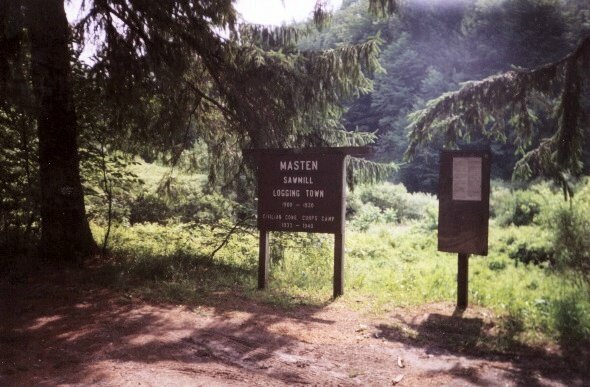 During the period of July 4-6, 2001 Terri Moore, a Black Lab dog named Gurtie and I hiked the 27 mile Old Loggers Path in the Tiadaghton Forest north of Williamsport, PA. We started the hike around 10:45am the morning of the 4th at the Masten Ghost Town sign along Pleasant Stream Road. We initially wanted to hike this loop type trail in a counterclockwise fashion so we could follow the guide book. However, since the map and guide book were not that clear about which way to start, we started the hike in a clockwise fashion instead. 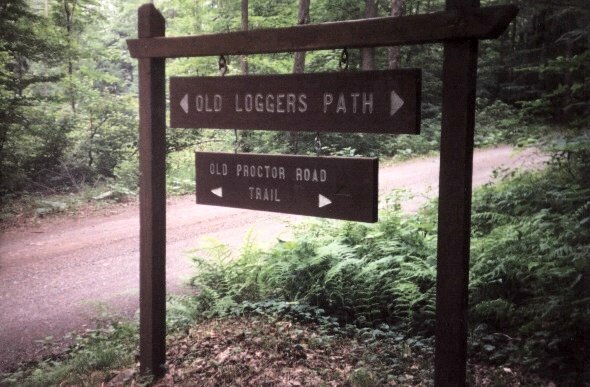 If you plan to do this hike, start at the Masten ghost town sign and proceed SOUTH about 75-100 feet till you see a sign for the Old Loggers Path, then turn right and start the hike. Then we started a first gradual, then really tough up towards Sharp Top Vista. This is probably the reason that they want you to hike this trail counterclockwise. This was a brutal up. When we got to the top we couldn't enjoy the vista because it was starting to thunder, lightning and rain. We were confused at this point because Sharp Top was not mentioned until the second day of the hike. There was a couple at the summit enjoying the view. They were packing up their chairs because of the rain when we asked them what road were we on. They weren't sure. 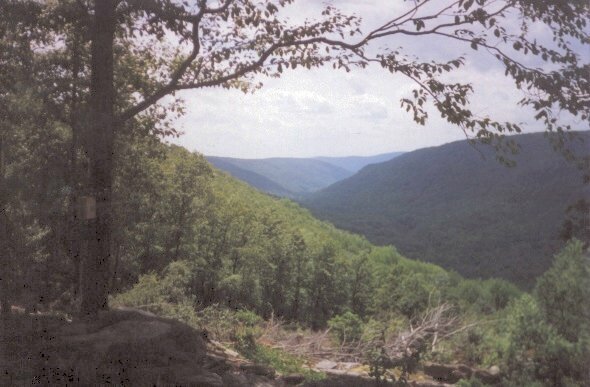 After about a quarter mile along a forest road we lost the trail and had to backtrack to the Sharp Top Vista. 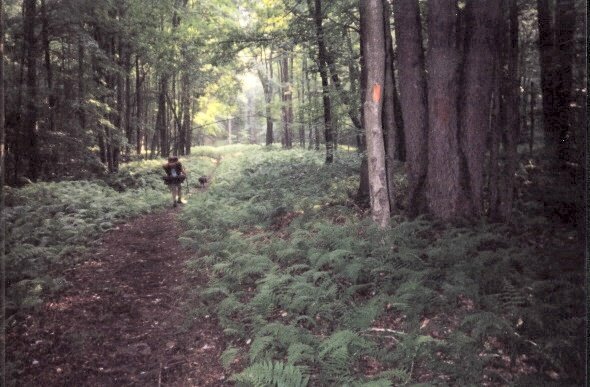 We then found that the trail cut off to the left through a bad stretch of trail. We then rejoined the forest road that we just backtracked from (GGGRRRHHH!!! ), headed through a downhill section that was overgrown due to Gypsy Moth infestation, then did a nice 1-2 mile down along an old railroad grade. Finally, we got to our camp site for the night at Pleasant Stream. 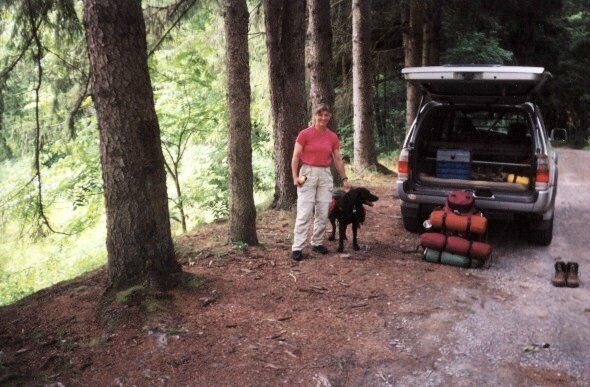 (We thought that we were camping at Doe Run, which is where the guide book says that you end up on the first day.) The rain let up but it was muggy. Gurdy chased a porcupine up a tree. This was the first time that I had seen one up close. She is lucky that she didn't get a face full of quills. We heard some fireworks going off between 9 and 10 and then intermittent gun shots during the night. So our sleep was intermittent that night as well. We did some more ridging, passed the Crandall Town Trail, which seemed out of place, then got to a nice vista and a trail junction that had no name. Terri was very concerned now as her GPS said that we were going north. Also, my cell phone was getting a signal. The reason was that we were the closest to the cell towers along US15 that we would be along this trip. We were getting a little worried now. We finally decended the ridge and got to Ellenton Ridge Road. (I was certain that this was Pleasant Stream Road!) It started raining again. The rain would again last about an hour like it did yesterday. We started descending along an old railroad grade and passing other backpackers for the first time on the trip. We started asking them what direction that they were going. The first 2 weren't sure as they had no map. The second and third groups confirmed what we had feared all along. We were hiking the wrong direction! Feeling totally embarrassed, we proceeded on and camped at the intersection of Rock Run and Doe Run, which was supposed to be the "late start" camp site for the first day if we had done the hike counterclockwise. Now that we knew where we were, we figured that we had done about 10 miles the first day, about 11 miles the second day and only had about 6.5 miles to do tomorrow. We met a nice local family out for a family outing as well as a group of local teenagers scouting out a good location for a weekend party. 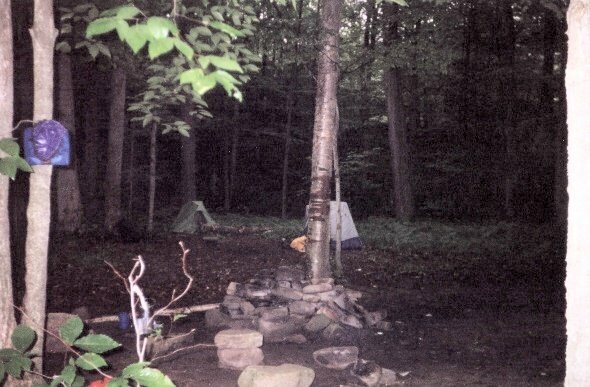 So please be advised that there are roads close to this campsite so you may be visited by the locals. We had a cool but clear night. 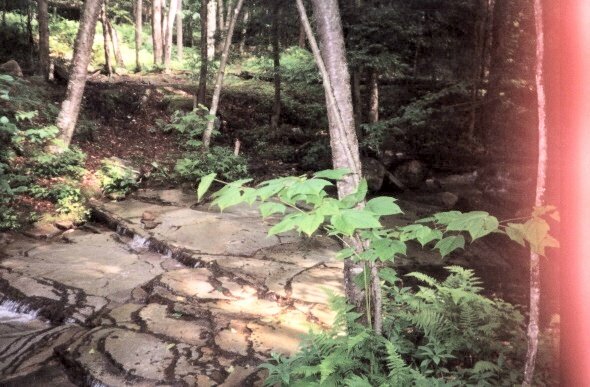 Both Rock Run and Doe Run are very pretty and worth exploring. 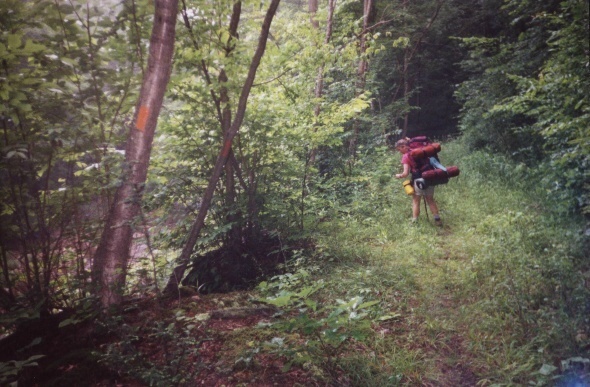 On the 3rd morning, July 6, we packed up, did a gradual up of about 3 miles, a down, another up and a last down. The trail ended up within sight of our cars. How we didn't see the trail head at the beginning of the hike is beyond me. The only animals spotted were a doe and fawn, a garter snake, numerous salamanders and toads and the porcupine. Rock Run on the OLP.